Junior guard Marquelle Dent and senior guard Kaitlyn Mileto combined for 37 points to lead the Wyoming women’s basketball team (4-2 overall) to a six-point win, 60-54, over the Montana Lady Griz (2-4 overall) on Thursday night in Missoula. The Cowgirls have now won three-straight road games against the Lady Griz. Dent finished her night with a game-high 22 points plus seven rebounds and four assists. Mileto added 15 points while shooting 5-of-7 from beyond the arc. She needs just two more three-point field goals to tie the all-time record with 215 for her career. Senior forward Kayla Woodward contributed eight points and a game-high eight rebounds followed by junior guard Jordan Kelley with seven rebounds. Wyoming shot 21-of-51 (.412) from the field, 9-of-16 (.563) from beyond the arc and outrebounded the Lady Griz, 41-39. Montana was led by senior forward Maggie Rickman and sophomore forward Alycia Sims with 12 points and seven rebounds. Junior Hannah Doran added 11 points off the bench. The Lady Griz shot 21-of-65 (.323) from the field and got 28 points from their bench. Freshman forward Bailee Cotton and Mileto scored the first five points to start the second half to increase the Cowgirl lead to 11, 35-24. Rickman hit a shot for Montana to end a four-minute drought. 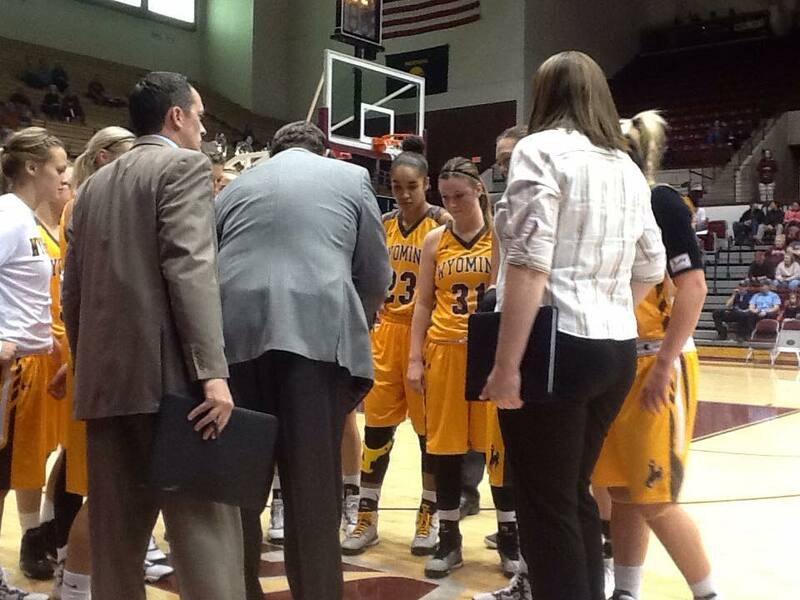 A three by Woodward put Wyoming up 13, 38-25, but the Lady Griz scored five straight to cut the lead to eight, 38-30. Dent hit a big shot to stop the UW scoreless stretch which started a small run to extend the run back to 11, 45-34. Back to back three-point field goals pulled Montana to within seven, 47-40, with 7:47 left in the game. The Cowgirls seemed to gain the upper hand with a 51-40 advantage, but the Lady Griz continued to battle back. Started by a three-point play by Doran, Montana closed the gap to seven, 54-47. A huge three-point field goal by Woodward put the Cowgirls up by double-figures, 57-47. The Lady Griz made one final push to make it a two possession game, 58-54. Free throws by Dent gave Wyoming the 60-54 victory. Both teams struggled out of the gate shooting 2-of-13 from the field through 15:13 left in the first half. Wyoming built a small 7-4 advantage, but the Lady Griz scored eight of 10 points to regain a 12-9 lead. Sparked by a Mileto three-point field goal, the Cowgirls responded with a 15-4 run to build an eight-point lead, 24-16, with 4:54 left in the half. Free throws by Valley ended a five minute scoring drought for Montana and six unanswered closed the gap to two, 24-22. Wyoming rallied with a 6-2 run to close out the half and take a 30-24 lead into the locker room. Mileto led the way with 12 points from four three-point field goals in the first half. Dent recorded seven points while Jordan Kelley led the way with five rebounds. Wyoming shot 11-of-30 (.367) from the field and 4-of-7 (.571) from beyond the arc while outrebounding the Lady Griz, 24-21. Montana was led by Sims with eight points and four rebounds. Doran added six points followed by Rickman and Rubel with four each. The Lady Griz shot 11-of-36 (.306) from the field and 0-of-7 (.000) from three.